Last weekend’s trip to the artistically bold Nikki de Saint Phalle sculpture garden was pretty astounding … but Escondido was harboring more hidden treasure in its nearby hills. 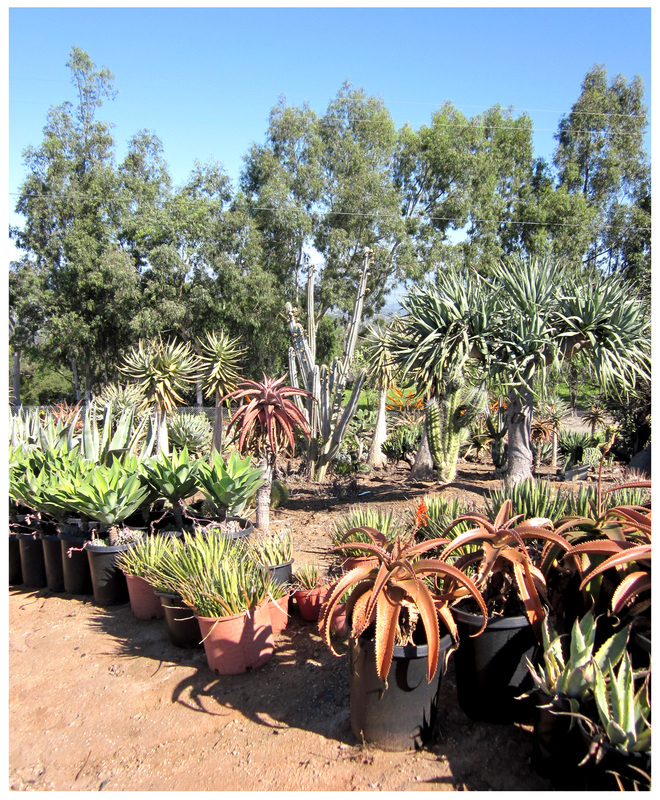 Using my trusty iPhone, I searched for succulent nurseries in the area. I found two that sounded interesting, but picked the more intriguingly-named Desert Theater Nursery as our next stop. Entering our coordinates into the smart phone, we left downtown Escondido, onto to the 15 freeway a short distance, then up into the hills … up winding roads, then more winding roads, then more … until we reached what seemed like the literal end of the pavement and a truly amazing sight: acre upon acre of succulents! 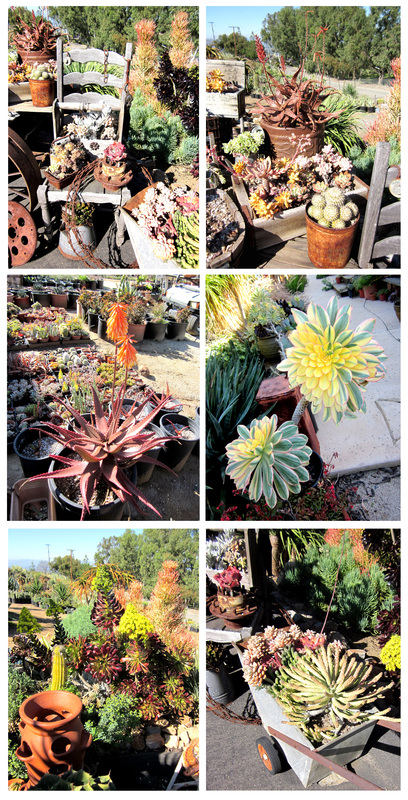 Huge succulents, prehistoric looking succulents, awesomely colorful succulents; gorgeously sinuous, curvy, spiky, prickly-poke-y-plump and juicy succulents! I’ve felt succulent-giddy before but never on this level. Only bad thing? They were closed! 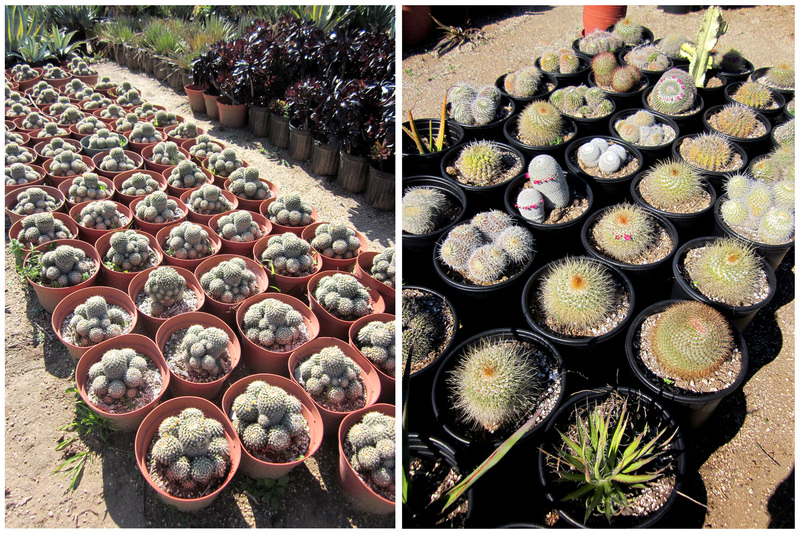 Another source of unbridled amazement: cacti in the hundreds, if not thousands, and in sizes small, medium, large and extra large! 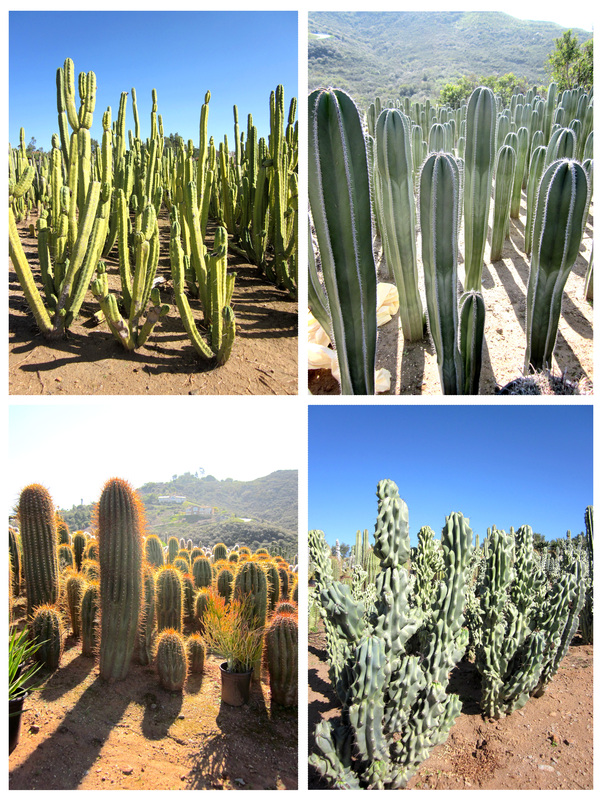 So much concentrated cactus energy in one place was awe-inspiring … I loved walking around, and among them; cautiously, of course. 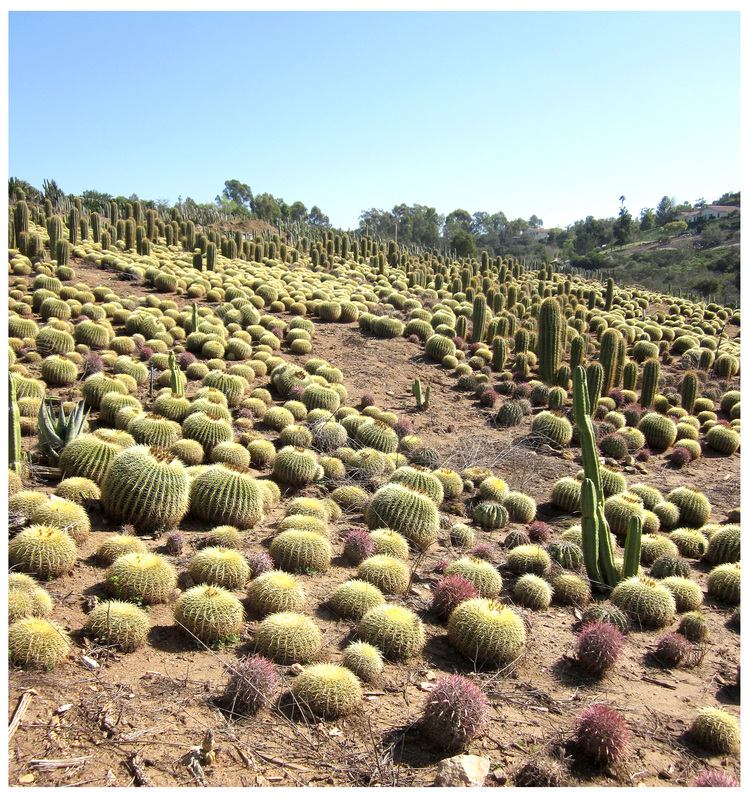 ﻿Did I mention there were barrel cacti? Only as far as the eye could see … seeing the spiky spheres trailing in loose columns across the terrain delights the eye and fills me with a very happy feeling. So fun! 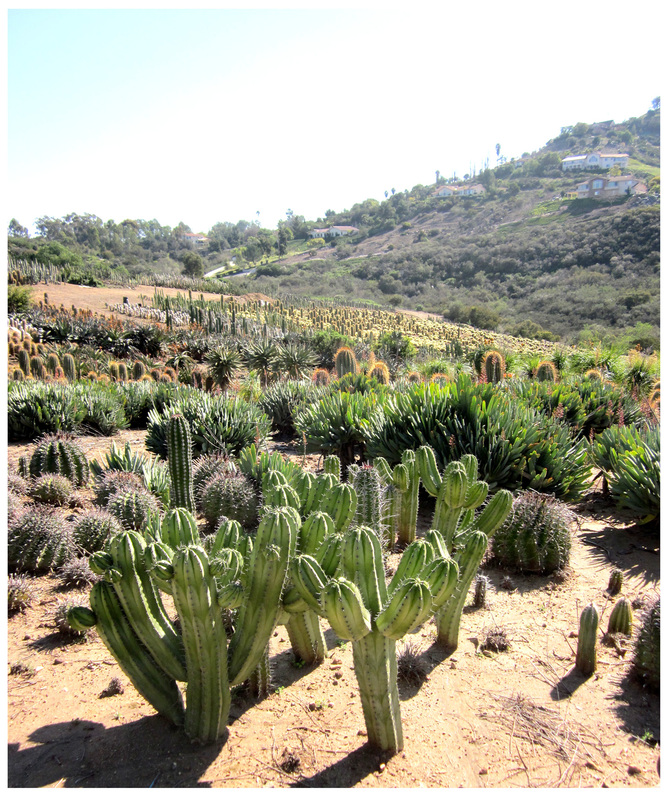 Sentries, soldiers and gnarled guardians, the cacti stand at attention, some with spine-edged furrows, in orange, and in white. Others are festooned more randomly with dangerously long needles. The patterns of light and shadow are entrancing but I’m careful to keep my distance … Again, I’m stunned by the profusion of plant sameness! Leaving the nursery proper, we head back up to the driveway and house, where smaller plants are grouped in charming arrangements. Aeoniums, euphorbias, senecios, echeverias, you name it, they’re all here in delicious combinations. Some are planted in clever old, rusted containers, and surrounded by more relics from times past, including old wooden chairs, rusted tools, chains and fencing. Very inspiring … I want it all! But the nursery’s closed, remember, and although someone has showed up at this point, she describes herself as ‘just the girlfriend’, and can offer only vague price quotes. Which is fine, really, since the car’s not ready for hauling anything, let alone prized succulent booty. So, we’ll wait. Call ahead, as is recommended, hopefully coming away with a couple of show-stoppers at wholesale prices … maybe next weekend. Geeeeez its like a dream! 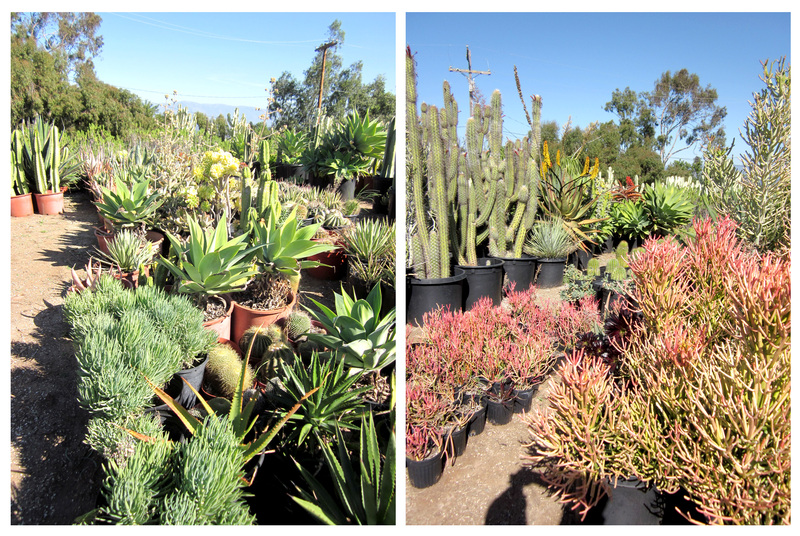 It really was unreal to see so many large succulents in one place! All I can say is wow. Never heard of that kind of place in Phoenix, or I would have visited, and gone nuts! I’m actually glad the nursery was closed, Dave… because ‘nuts’ was imminent! Torturous is exactly what it was! A chance encounter with long-ranging effects, I’m thinking! what a bounty! those barrels were gorgeous! i want to go! You gotta go, but first call ahead … or, like us, you’ll have the frustration of no one being able to give you prices or sell you anything! Wow, that is spectacular ! Wish they’d been around back in the day when I was a San Diegan..or maybe not, as I have little or no restraint. Oh my gosh! This place is spectacular! And the pictures don’t really do it justice! Wow… A Rancho Reubidoux Disneyland! !